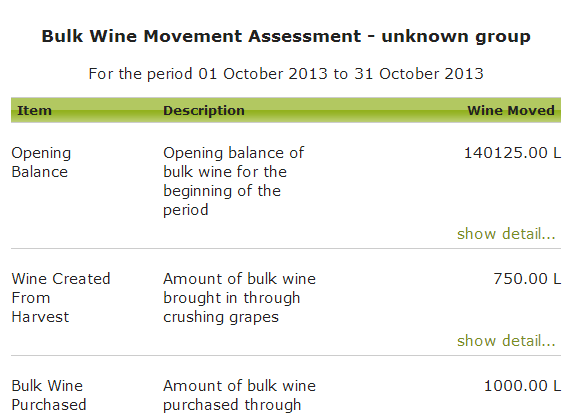 In Vinsight you are able to view a report that shows you all your bulk wine movements for a period of time. This can be required for special tax reports required by an authority. This is achieved in Vinsight by creating a new “Bulk Movements Assessment”. Bulk Movements can be found in Make > In the Winery area. Click ‘New’ to create a new assessment. At the top of the assessment page, you will see various options that you can change about the report, such as Date From, Date To and Group By. Once you have the options correct, click “Run Assessment”. If they are not equal, there may be some inconsistencies in your data, or possibly a movement has happened that the assessment does not yet account for. You should look at the detail for each section and check that the operations listed make sense and agree with the actual movements of that operation. You may need to contact Vinsight Support to help resolve any inconsistencies. The spreadsheet will probably be of most use if you group the report by Batch Code before downloading. The spreadsheet includes a column at the end of each row that calculates the different between the two closing balances. Ideally these will all equal 0.